Hi guys! Today I'd like to show you a layering experiment I did a little while ago. I started with China Glaze First Mate, on top went Milani Cyberspace from the 3D Holographic collection, OPI Last Friday Night, Golden Rose #10 aaand... *gasp* ...matte topcoat. That's a mouthful. I really love the endresult, it looks like some kind of marble from outer space hahah. Quite interesting. Surprsingly Last Friday Night, which usually turns any polish into magic, was a bit unnecessary this time as it was hardly visible on top of Cyberspace. 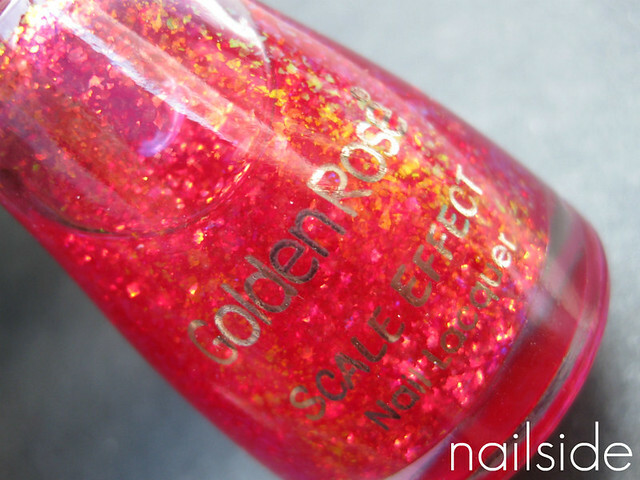 Golden Rose #10 on the other hand is just mind-blowing gorgeous! Pretty red flakies. In the bottle you can see them shifting from red to gold, to green and blue. But even after a zillion shots I wasn't able to capture the complete rainbow. A shame, because it's so pretty in real life! wow these create such a good effect! so pretty, I love flakies! I love this! 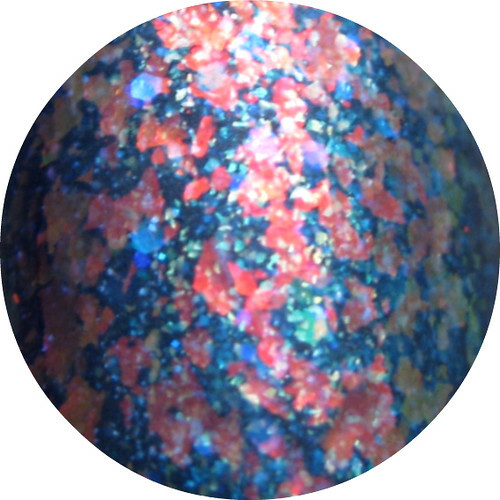 It reminds me of the book The Rainbow Fish from when I was a kid. So pretty! Wow, gorgeous. I love layering. I think you can achieve so much more than polish alone, but geez, this is to pretty. Wow! That's a beautiful layering combo!!! Dare I ask--where you do get Golden Rose polish? Pleeeeeze tell me you can get it in the US? *hoping* These international polishes are killing me! That satellite just crashed on your nails I think. xD Looks gorgeous! Seconding what Manicured Slayer asked! I love these flake-glitters but I have no idea where to get most of them! Wow! That looks amazing, what a fantastic result, not can you please bottle that so we can buy it please? Olive, Manicured Slayer and I want to know how to get some golden rose flakes. I googled but got nothing. Would Nfu oh48 be a close substitute? It's in the first comment. Sadly for some, I found out all of these shops don't ship outside Europe. However, this Dutch webshop, www.nailwebshop.nl, does ship outside the Netherlands but doesn't say anything about whether it should be in Europe or not, so send them an e-mail first (info@nailwebshop.nl) to find out whether they ship to your country or not. My bottles of Golden Rose flakies were bought at an event, so I don't have any experience with the webshops mentioned in the link. I hope this was a little bit helpful for most of you and good luck!